Monday morning, rise and shine! It’s a new beginning, a fresh start, a day for opportunities to abound! Don’t even talk to me before I’ve had my coffee. Then get your coffee Ms. Crabpatch and get busy. Just take a look at the gorgeous sky. Do you realize the temperatures are in the single digits? Maybe I’ll just crawl back into bed. Now is that any way to accomplish your goals? Where’s your resolve for those plans you made? Are you giving up that quickly? Please tell me I’m not the only one who has those self-talks. It’s like the angel on one shoulder, demon on the other, each of them whispering into my head, but I have to make the choice. It’s true – the week is full of opportunities. Monday is the start of a fresh new week, a chance to have this week count as a success in my planner. Before I started using my bullet journal, I had plans in my head. I kept a mental to-do list and rarely got past the first two. But then I discovered the bullet journal! This amazing tool is priceless to me. I don’t keep it up every day, and I’m not going to stress over that. Life has gotten pretty crazy over the past year and I’ve learned to chill out and do what I can and go with the flow when I need to. MLO job – correspondence with emails, check sop updates, check rates, make calls, upload documents. At first glance, you may not notice a big difference but it’s there. realistically, I know I am not going to get the entire house clean in one day. I’ve decided to focus on one area per day. Since I’ve been doing it this way, my house is cleaner. It’s not where I want it to be yet, but that’s because of the clutter. Much improved, but still room for more improvement. I have to do certain tasks for the dayjob, so that doesn’t change other than I don’t stress out about it like I used to. There are days when I only get a couple tasks completed, and that’s OK. Some processes take longer than others. My daily word count used to be 2500. It will go back up to that but for now, I am trying to hit at least 1000 words daily. To be honest, on days when I have appointments or therapy, it may not happen. Last Friday I had an appointment, I couldn’t concentrate before the appointment, then afterwards I crashed! I didn’t realize that I had been so keyed up over that appointment, but apparently I was. I got a whole whopping 460 words last Friday – I still count that as a win because I got some words. My point is, back to the opportunities; by not putting a bunch of constraints on my schedule, I have the flexibility to adapt to those urgent things that pop up unexpected. Before, I never allowed ten minutes downtime so if anything happened, anything, I was stressed and freaking out because I didn’t have the wiggle room. For instance – being stuck in traffic. I sat in traffic for nearly 2 hours on a drive that should have been thirty-five minutes. It was aggravating, but I took the opportunity to enjoy the music on the radio. It was soothing. What could have been a very stressful 2 hours turned out to be calming. I couldn’t do anything about it anyway but in the past I would have been biting my nails, yelling at the moron driver who caused the accident up ahead and probably using some colorful metaphors in my monolog! We can take the opportunity to take charge of our lives, how we deal with what life throws at us or we can take the approach that we are helpless victims being tossed about by the wind and waves. The storms are going to happen so be prepared! Some of them can be avoided. Sometimes we get caught out in the rain. Other times, we have plenty of warning. Seize the day while you can! By the way, I stayed up, I went to my exercise class, I did the things, and I feel better for it. Regret is a hard task master that I plan to avoid! There is nothing that can beat you down faster than a bad case of the ‘should-haves’. Is there one thing that you can do today to improve your outlook or decrease your stress levels? Welcome to Flash Fest December! I have some author friends who have joined me in this challenge, and are contributing to the prize baskets! Leave a comment throughout the week on any blog post, whether it’s the blog hop, flash, guest spot, or weekend writing warriors. I will select one of the commenters through Randompicker and post it on Monday’s post ( or rather Tuesday as it’s been lately, since my internet connection has been sketchy.) That person can contact me on Facebook or email me at: l.e.mcatee@gmail.com. The challenge is to write a flash piece, 500 to 1000 words based on a Holiday tune as a prompt. The author was given the option to select their own or I would assign one. Trust me, my list of holiday tunage is anything but traditional! So, even though this isn’t a flash feature, any comments will still count towards the prizes. MFRW blog hop week 51 – Advice for new authors. Just one more week to go! What advice would you give newbies? What advice do you wish that others would have given you when you were a newbie? Those are the two main questions that I ‘ve been contemplating for this post. I have to admit, it took a bit of contemplating to decide which tidbits to share. A couple of pots of coffee, a few oatmeal cookies – sugar-free of course, to dunk in my coffee, and my trusty notepad to jot down what came to my mind. These are the three bits of advice that I wish someone would have shared with me. I hope it helps you if you are an aspiring author. Decide what you want to write. What genre do you feel comfortable with? What length of work do you feel comfortable with? There are other options for a writer besides book-length novels. When I first began writing, I wrote articles for magazines, and for a column in our local paper. The short 1000 word articles rolled off my fingers with minimal effort. But, my dream was to be a published author like my idol Katie McAlister. It is difficult to make myself focus on longer length works, but oh so satisfying to hit ‘the end’. 2. Schedule time for your writing. Make it a priority. If you write whenever you have time, you’ll find everything in the world crowding out your writing time. Make an appointment with yourself and KEEP IT! Just as if it were a doctor’s appointment. IF this is what you really want, then make your goals a priority! 3. Stick to one project at a time! (Best advice I ever got from my friend Vicki Locey! Thank you, Vicki!) I’m the world’s worst at having too many irons in the fire, with multiple books in the works. It wasn’t until I made myself focus on one project and stick with it to completion that I got my books published. Notice, that completed does not mean published. I have five books that are completed but need revisions and editing before they are publishable. It’s ok to jot down ideas for new stories while you work on your current WIP. FOCUS is a key factor to success as an author. I have to admit my ADD tendencies fight me on this point. I made myself a system of rewards for tackling the current WIP first, before anything else. For instance, when I have my writing time, lately has been in the afternoons because of doctor appointments, I set my timer, and write until the timer goes off. Now I may get up and get a cup of coffee or cocoa, or run to the bathroom, but during that time I write. Most days I manage about 1200 words. Then I reward myself. Maybe it’s coloring in my planner, it’s one of those adult coloring book planners. Maybe I play a game for a bit or jot down notes for another story. If time allows or if I am really in the zone, I may work on writing for a longer period of time. If you can master those three things, you are well on your way to success! You can read other participating authors HERE. 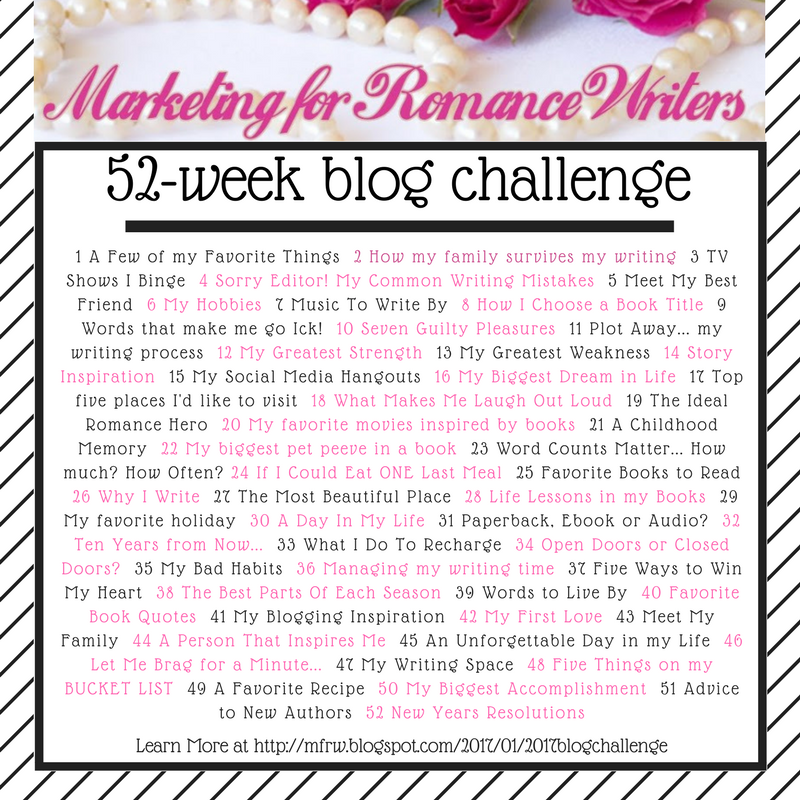 This week’s MFRW blog hop post – week 48 – 5 Things on My Bucket List. First, I have a couple things to say before we dive in. I am so grateful to my friend Cathy Brockman, for sharing this blog hop. At a time when I was at my lowest low, thinking I may not survive the breast cancer, this blog hop kept calling to me to get back to writing. Yes, I’m well aware that I can be overly dramatic. My father called me on that one back when I was like six. Anyway, it may sound silly but this blog hop, even though I missed several months for a while, kept calling me back. I have met ( online ) a great group of authors associated with this blog and read their blogs. I don’t always leave comments, but I read them. The Bucket List is something that became all too real to me during that time. Focus on what’s important and let the rest go. I had to keep reminding myself of the four agreements, specifically do your best every day. Some days my best was get to radiation, eat something, and sleep. That was it. Cancer treatment is different for each individual and for me, fatigue was a constant. It is still a long road to recovery, but I’m getting there! Now, on to 5 Things On My Bucket List. There are many more items on my revised bucket list, but I know you have better things to do than stay here reading. In fact, why don’t you share something off of your bucket list in the comments. Come on, do it! Just one item, you can do that right? I don’t know if any of the others participating in this blog hop have this problem, but with every prompt comes a flood of questions. It takes me a good while to go through the questions and decide if they are valid or not. This is a process that started with me way back, . . . yeah back to my childhood days just shortly after the stone age. How far back? What topic? I mean, a scary memory? fun memory? life lesson learned? funny memory? sentimental? How can I narrow it down? Should it tie in with last weeks post about movies? Does it tie in with writing somehow? What does this have to do with writing? What if . . . . and then I have to tell my brain to SHUT UP! This pattern emerges somewhere before kindergarten. I learned fairly quickly to keep them to myself as I often got in trouble for asking too many questions. That is a whole other post and that’s not the memory I decided to share. That will go under the category of my mother, learning to deal with ADD, and a creative mind. Maybe I should do that. Anyway, the memory I decided on is one I will never forget. I grew up in a small town south of the St. Louis metropolitan area. It’s a rural area just outside of a small town. In the midwest , e get hot summers, sudden thunderstorms and are always ALWAYS aware of the possibility of tornadoes. The morning started out as any summer morning. It was my job to go out and pick strawberries. My parents had June bearers, which means they put on fruit for about three weeks heavily then are done for the season. School had just let out the week prior and it was my parent’s method to make sure I knew that I wasn’t going to be a slacker. Chores had to be done before my fun started. Most of the time, picking strawberries was an easy task as I love strawberries and I would wash about a pint for myself and eat them. Cost of labor, right? Plus it was a nutritious breakfast. Trust me, I wasn’t thinking about nutrition at that age, I was thinking strawerries – yummmm! While picking the berries, about three forths of the way down the row – the row was about twenty feet long and three feet wide – I reached for a big juicy berry when movement caught my eye inches from the berry. A snake! Not some little five inch snake, NOOOOOOO! It was a full grown three to four footer. I know now that it was a king snake, not harmful but tell that to my ten-year-old self. OH heck no! He could have the rest of the berries. I grabbed my buckets that I had filled and ran to the house. I set the berries on the counter and realized there was one more bucket out there. Out there where the snake was. I had to go get it. It was going to rain and I needed to get them. Berries don’t keep well once they are picked. Anyone watching would have thought that the entire garden was infested with cobras. It may as well have been. I knew from experience of where we lived, snakes could move fast. We had a few blue racers around the yard, we had the occasional copperhead show up, and black snakes were common. It could have been anywhere. Two steps, then looking all around. A couple more steps, watching the vines and foliage around the beans, the cucumbers, the tomato plants. There weren’t any vegetables on them, but there was foliage where a clever snake could hide. I could see the bucket ahead about ten feet away. The closer I got, the slower I moved. My heart was in my throat, pounding out a tattoo of terror. I was bending, reaching for the bucket when I saw it less than three feet away, slithering from the strawberries towards the neighbor’s yard through the fence. I grabbed that bucket and ran like my clothes were on fire. Three gallon-sized buckets of berries sat on the counter. I wouldn’t eat any. Dad wouldn’t know that I didn’t finish. I would offer to mow the lawn, wash the car, clean the garage, anything that didn’t involve the garden area or snakes. I couldn’t tell you what time of day it was other than at noon Mike’s mom would call him for lunch. That was our cue that it was lunch time. I’d cycle back home, grab a tuna sandwich or peanut butter, drink a gallon of tea then vacuum mom’s big rug in the front room, wash the dishes then run back out the door. When Brooke’s dad pulled into the driveway it was time to head home. My dad would be pulling into the drive shortly after his. That meant it was time to clean up and start on dinner. I offered to cook dinner in order to get more allowance. I liked to cook and every kid needed money to get pop and candy at the local gas station. “Ummmmmm.” I’m a terrible liar. “Why didn’t you finish?” He showed no emotion, no anger, just a simple question. “Dad! There was a snake. I could have been bitten. He was huge!” My heart began to race. “Well, I’m sure he’s long gone so go out there and finish up.” As a parent, I can appreciate this now but at the time, I would have sworn my father was sending me to my death sentence. I knew there was no reasoning with him. I knew he was right, I had seen the snake leaving. But what if he came back? What if he was waiting for me? What if he wantto curlurl around me and constrict me then eat me whole like Kaa? I grabbed an empty bucket and walked, head down, towards the strawberry patch. My steps weren’t cautious like before, what did it matter if the snake shot out like an arrow and latched onto my leg. If I were going to die, then it was going to get me one way or the other. I knew exactly where I had left off. The telephone poll was about a foot behind the place I stopped. Plus for anyone who has ever picked berries, it’s easy to see there are red berries here but not there. I knelt down, picking the berries as quicly as I could. I wasn’t as careful as I should have been, seeing a few green bottoms when I dropped them into the bucket. I knew dad would have something to say about that, reminding me that they needed to ripen. I stood, one foot on either side of the patch, so that I could move quicker down the row. There was only about four feet of row remaining and if I managed to get to the end of the row without being bit by a snake, or the imagined tangle of multiple of snakes that I knew were just waiting to strike. My heart pounded as I filled the bucket. The end was in sight. There was only about ten inches of row left. I could do this. I might survive after all and not end up with the epitaph on my tombstone: Done in by strawberries and the snake that resideth therein. A particularly large berry, at least four inches wide, red and luscious. My mouth watered remembering that I hadn’t eaten any that morning. Maybe dad would like some strawberry shortcake for dessert. I reached for it. Confident that I was about to cross the finish line unharmed and return to the house victorious. Then the brown stick that was laying at the end of the row curled up and moved. I had been bent over, knees slightly bent, one foot on either side of the row as I worked my way towards the end. I shot up arrow straight, eyes wide, shaking like a leaf. This was not a king snake nor a black snake. It was a copperhead. Copperhead’s are poisonous. I didn’t dare move. Any movement might make it strike. I was frozen. Well, aside from the shaking bit. My jaw clenched tightly as I stared at the snake. I couldn’t let it out of my sight. I couldn’t turn and run. I couldn’t move. “Stay still, don’t move.” Dad’s voice behind me was both comforting and disconcerting as I detected a note of seriousness in his voice that wasn’t usually there. Slowly, he walked down the path between the strawberries and beans. One step at a time, stalking his prey. When he was just about even with me, he raised the hoe overhead and held it there for a minute before bringing it down with every bit of strength he had. In one move he had chopped it’s head off, picked up the tail end and tossed it behind the neighbor’s garage, then picked up the head with the hoe and flung it in the same direction. I let out a deep breath as I plucked that last berry, grabbed my bucket and walked as quickly as I could towards the house. My father’s two joys were gardening and fishing. I am grateful that he taught me about gardening even though I didn’t listen half as much as I should have. I’ve had to learn some of his wisdom through my own trial and error. I am glad that I was his “fishing buddy” for many years. He didn’t often talk, but occasionally. . . occasionally he would offer pearls. We had our differences at times, but my dad was always my hero. I miss him terribly. That night after dinner we enjoyed our strawberry shortcake, and dad made sure I got the biggest berry. When I sat down on the sofa reading a book, I overheard him telling mom that he was proud of me. That I finished the job even though he could tell I was scared. He had followed me out, going to his garage/ work shop. He watched me out the window for a few minutes and he knew the minute I saw that snake. My wild imagination often got me in trouble as a kid. Asking a million questions also got me into trouble. My father was far more patient than my mother. His method of dealing with my questions was to answer them to the best of his ability until he could find something else to distract me. At some point in our lives, all we have left of our parents are our memories. We sift the bad and keep the good, choosing to hold onto the moments that shape our lives. Father’s Day is coming up soon, if your father is still with you do something to honor him. Take time to visit him. Share a memory that means a lot to you with him. Ironically, this wasn’t the memory that I was originally going to share, but it’s the one that came up. Perhaps another time I’ll have the opprtunity to share about the tornado. Until then, go check out what the other’s are sharing on this blog hop! Helen Henderson – Whooa. Too fast. Edward Hoomaert – Jiggers, it’s da cops! Leave a comment below then visit the other authors. Write on my friends, write on! Greetings everyone! It’s a been a while since my last post and even longer since I made an MFRW post. Life has been – different. I’ll address all of that later, but for now . . . . on to the fun stuff! The topic for this week – week 20 – is My Favorite Movie Inspired by a Book. I realize that many of my constituents (aka other bloggers participating in this blog hop not to be confused with political opponents vying for same geographic region) will probably reference some of the most recent book/movies such as Divergent, The Hunger Games, 50 Shades. Not me. The subject is MY favorites. There are many movies made from books, then made into screenplays. There are movies based on books. Quite often I find that I greatly prefer the book to the movie. There are a few that have translated well to the big screen. It’s amazing what they can do with animation these days, isn’t it? Well, the book made me cry when I first read it to my kids, and that same emotion hit me when I watched it the first time. No, it’s not a sad movie. It’s a wonderful story. They were tears of joy, heartfelt compassion. Yeah, I’m a softie. I cry at commercials sometimes as well. Inconceivable how anyone could not like this movie! This is one of the rare instances that I prefer the movie to the book. If you haven’t seen it, why not? GO – get it now. Download it on Netflix or Amazon and watch it. I’m serious! The novel is actually the fourth book in the Chinese author’s five-part Crane-Iron Series. This martial arts extravaganza is well-written, with a wonderful plot, great characters, action, drama plus it has Donnie Yen, Jet Li, and Michelle Yeoh! Maybe you aren’t a martial arts fan, but this movie is worth your time. I never read the book for this one either but I saw an interview with Jet Li where he stated about reading the book and he was excited that it was going to be made into a movie. I’ll warn you though, most Asain movies don’t have a happily ever after. Often they are tragic. This book/movie – and the movie followed the book fairly closely – has a dynamic plot that engages the reader/viewer, keeping you on the edge of your seat. It’s not just another cheap Martial arts movie – this one is worth your time! Probably not what you would have expected, but there you go! I could list twenty others that I liked but these three are at the top of my list. What’s your favorite book adapted to the big screen? Leave a comment below and let me know. Write on my friends, write on!